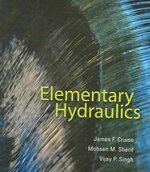 Elementary Hydraulics 1 Edition Elementary Hydraulics is written for the undergraduate level and contains material to appeal to a diversified class of students. The book, divided into three parts, blends fluid mechanics, hydraulic science, and hydraulics engineering. The first part of the text draws upon fluid mechanics and summarizes the concepts deemed essential to the teaching of hydraulics. The second part builds on the first section while discussing the science of hydraulics. The third section looks at the engineering practice of hydraulics and illustrates practical applications of the material covered in the text. In addition to these applications, the text contains a number of numerical problems and a reading aid at the end of each chapter to enhance student learning.